Ten years ago, you might have thought about an incidental round of golf in Cambodia while taking in the rich cultural attractions of ancient Khmer civilizations, but you wouldn’t have thought of booking a golf holiday there. Now that has all changed. 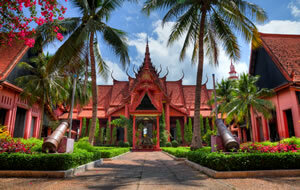 In recent years, Cambodia has truly come into its own among SE Asia golf holiday destinations. It has to do with the golfer demographic being the most sought after niche by tourism ministries in the free world. Not only do golfers tend on average to spend a little more and specify better than average accommodations, dining, and transportation, their demands for better than average everything stimulate private sector investment and raise the bar on a developing economy’s tourism product. Cambodia’s commitment to golf tourism may also be due to their prime minister’s fondness for the game. He frequents his home course regularly enough to keep a 15 handicap intact and the priority his administration has given to golf development shows astute foresight with the dawning of ASEAN unification on the horizon. Cross-border business and travel will become virtually seamless throughout SE Asia, and the kinds of executives and investors that will be setting up subsidiaries and branches typically include golf in their agendas. They also are prone to command a word of mouth sphere of influence, both digital and personal, that will stimulate golf vacation travel. Cambodia’s foresight is evident in their concentration of golf development around two key destinations that are already on the radar of international travelers, Phnom Penh and Siem Reap. Other countries that have worked to introduce golf as a tourism magnet without proper consultation have sometimes initially made the mistake of spreading new development around in a tourism ministry strategy calculated to allocate golf development equitably among official tourism destinations. But, no golfer is likely to travel internationally to a destination with only one golf course. Cambodia is on the right track in developing true golf destinations. If you are new to us, you will expect to see our selection of interesting Cambodia golf packages, but what members and guests that have traveled with us know is that you can modify, substitute, or add your own preferences to any of our golf packages or even create your own from scratch with the help of our golf booking professionals. Whether you choose a turnkey package or create your own tour, a good place to start is by familiarizing yourself with the fine inventory of Cambodia golf courses and from there review our choice Cambodia hotels. International golf holiday decisions are often motivated by proximity to cultural touring opportunities and Cambodia is seeing its UNESCO World Heritage destination of Angkor Wat at Siem Reap continuing to make headway as a popular golf destination. But, golf appeals to more than vacationers. Business travelers often include a round or two with business associates when on the road and Phnom Penh golf courses see their fair share of international guests along with resident expat executives. The capital city is not only the seat of public and private sector business in Cambodia; it is also the primary arrival point for inbound leisure travelers. 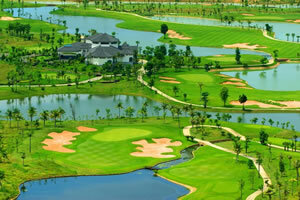 Phnom Penh has three 18-hole golf courses on its outskirts with more golf development on the way. The most recent addition to the Phnom Penh golf mix is Garden City Golf Club, only ten minutes north of town and managed by the venerable IMG group. Royal Cambodia Phnom Penh Golf Club is only five miles from the capital city and, being the most convenient course to Phnom Penh, it is the favorite of key dignitaries and executives. Cambodia Golf & Country Club is located about 20 miles out of town in a picturesque setting and is a Taiwanese and Japanese joint development. 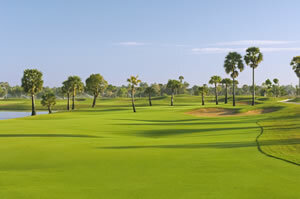 Grand Phnom Penh Golf Club is a private golf club designed by Jack Nicklaus just north of the capital city. It is part of the impressive Grand Phnom Penh International City master development. Siem Reap, the home of the World Heritage sites at Angkor Wat has three fine courses open, and has hosted the Asian Tour Johnnie Walker Classic and Cambodian Open events in their highly successful cultural tourism destination. Sofitel Phokeethra Country Club opened at Siem Reap to good reviews by guests visiting the World Heritage destination and was the venue for the Johnnie Walker Classic and they hosted the Cambodia Open. Within a year of the Phokeethra launch, the Nick Faldo designed Angkor Golf Resort opened and began welcoming golfers to what many think is not only the finest course in Cambodia, but also one of the best in the SE Asian region. The following year, Siem Reap Resort Golf Club debuted to approving patrons and elevated Siem Reap to a full-fledged golf destination. Golf projects in the planning and development stages show the ambitious nature of Cambodia in claiming its place among SE Asia’s esteemed golf destinations. Some previously announced projects have changed status, so if you don’t see it here its status is uncertain. Phnom Penh – Most notably on the future horizon are 1) Vattanac Golf Resort, a Faldo luxury resort with two 18-hole tracks just outside Phnom Penh; 2) 27 holes just outside the city at LYP Resort & Golf Club; and 3) halfway between Phmom Penh and Ho Chi Minh City, Cambodia Vietnam Friendship Golf Resort is slated with nine of its holes in Vietnam and nine in Cambodia. On the par five 18th, you will tee off in Vietnam, hit your second shot into Cambodia, and play your third shot to an island green bisected by the border.